“80G” of the income tax act is the vast topic, this article reveals the facts on Tax deduction donation under section 80G made to certain charitable institutions under section 80g of income tax act. Charity is treated as humanity towards society, help for the poor, that’s why Government provides relief under section 80g of the income tax act to encourage people for the better India. In some cases, charity is 100% exempted from tax. An amount donated by an individual to an eligible charity can be claimed as a tax deduction while filing an income tax return. 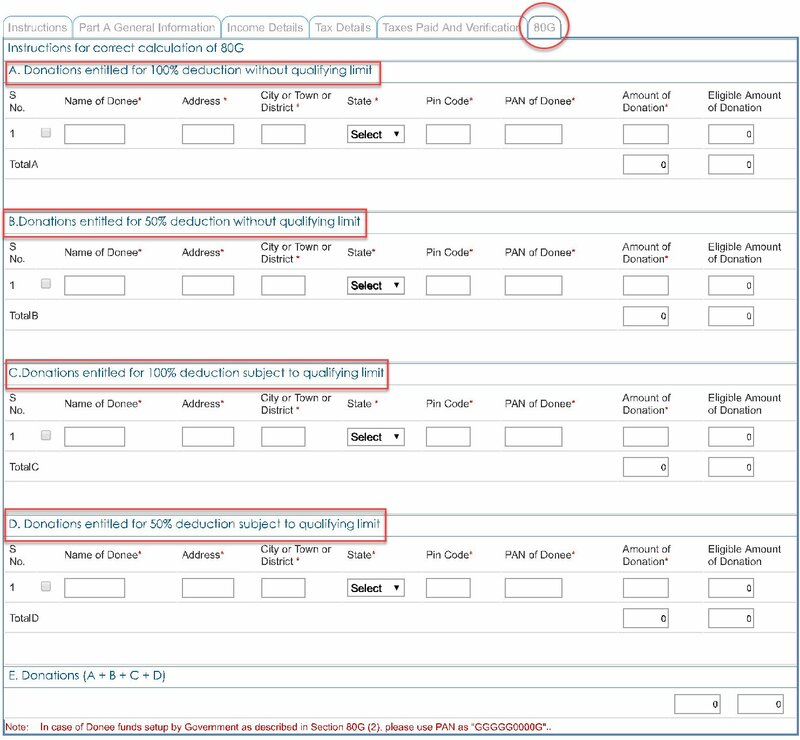 There is a separate sheet available in the ITR form which required completed information, the amount declared as clarity would be adjusted as tax exemption according to the limit prescribed of the income tax department. Under this category, the donation made is 100% deducted and are not subject to any limitation under section 80G. Any fund set up by State Government of Gujarat for providing relief to the victims of an earthquake. Any trust, institution or fund to which Section 80G(5C) applies for providing relief to the victims of the earthquake in Gujarat. 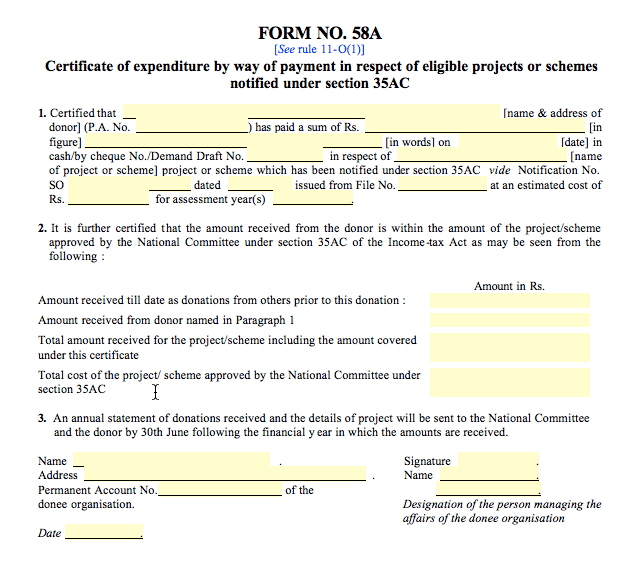 This portion is indicated in the form in section B, under this category, the donation made is 50% deducted and are not subject to any limitation under section 80G. This two category above (Section A & Section B) hold the benefit of without qualified limit. The qualified limit is (Subjected to 10% of adjusted gross total income). Sums paid by a company to Indian Olympic Association, the institution established in India for the development of infrastructure for sports and games in India or the sponsorship of sports and games in India. Any fund or any institution which satisfies the conditions mentioned in Section 80G(5). Repairs and renovation of any notified temple, mosque, gurudwara, church. Eg: If your adjusted gross total income is ₹ 600000, then you are entitled to deduct (10% of ₹ 600000) i.e. ₹ 60000 for the case of (100% deduction subject to qualifying limit (section C)) & ₹ 30000 for the case of (50% deduction subject to qualifying limit (section D)). The maximum limit to claim 80G under 80C is ₹ 150000. When an individual pay a sum amount there must a paper trail required to prove the claim u/s 80G as support. The receipt should be in a proper format duly seal and signed by the authorized person to the trust. The amount paid by you should be clearly mentioned both in figures and numbers. Received should be addressed to you, with proper name and address along with your PAN number. The PAN number of the trust is also indicated on the receipt. Registration number of the trust along with validity is also mentioned on the receipt. If the donor is entitled to deduct 100% donation amount, It is mandatory to receive form 58 from the trust, without Form 58, your claim might be rejected. This form is also known as “80g donation receipt”. Donations made to foreign trusts is not elegible for deduction u/s 80G. As we all known Form 16 reveals all the TDS deduction made by the employer to the employee If an employee claiming u/s 80G, it must be informed to the employer before issuing of Form 16 and the same will reflect in Form 26AS. If you are unable to inform the employer or Form 16 is issued before, you must adjust the amount while filling your ITR. I’M salaried employee, I have received Rs.1,15,000=00 salary monthly . I have taken House building loan,paying Rs.37,500=0 as installments monthly. How many amount donate for deduction u/s 80g.